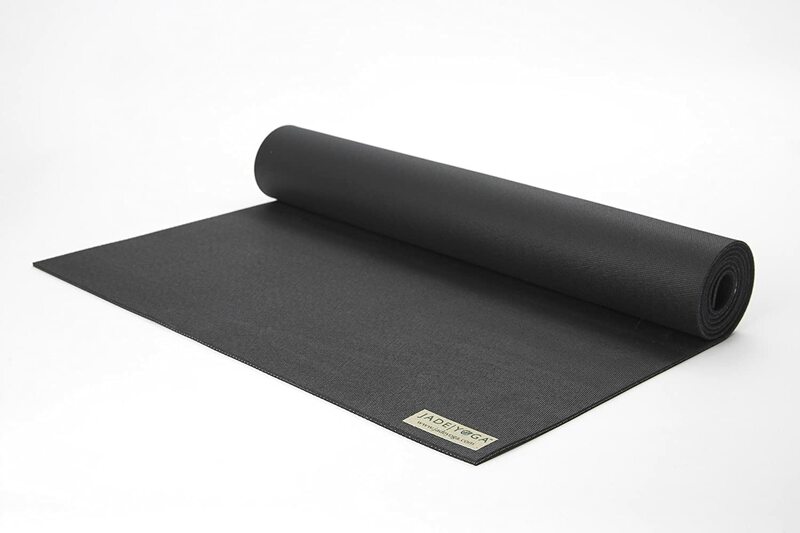 The Jade Harmony Professional 3/16-Inch Yoga Mat provides a place where you can practice yoga safely and securely. With its nonslip surface and environmentally friendly materials, you’ll feel physically and emotionally comfortable during every yoga practice. 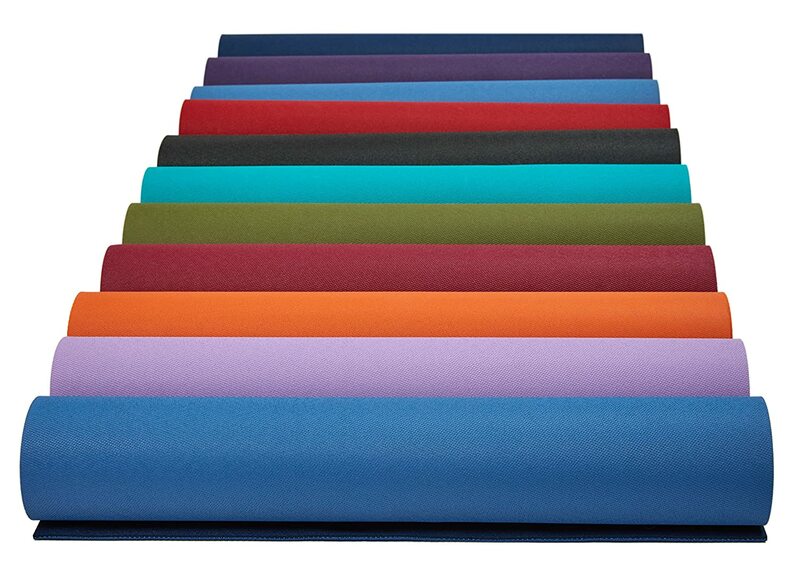 The mat’s ideal thickness level protects your knees when you’re performing poses that require you to put pressure on them while the option of choosing from nine different yoga mat colors ensures that you’ll be able to show off your personality at the studio. Jade mats are made with natural rubber, and they feature open-cell construction. In producing the mat, the company does not use PVC or other substances that negatively impact the Earth’s ozone layer. Jade mats are biodegradable, so this won’t be your forever mat. In fact, your practice frequency will determine its longevity. If you use it five or six times a week, then it will last you about a year or two. If you tend to be a yoga weekend warrior, then it may hold up for four or five years. Jade includes a label to help you determine which side of the mat to use. The label should always face up. Once you’ve worn out your Jade mat, you can repurpose it by using it as a seat liner in the back of your car when you’re transporting an animal to the vet. Old mats work well under area rugs to give you a nonslip grip. They are also ideal in the garage. You can place your old one in front of your tool bench for foot support or under a car to prevent oil stains. The Jade Harmony mat is 24 inches wide, and it comes in two lengths. You can choose a mat that’s 68 inches long, or if you prefer a little more personal space during your yoga practice, order the 74-inch size. Jade mats are easy to wash.
Just use warm water and soap. Once it’s clean, lay it out flat to dry. Keep in mind that Jade mats absorb water, so when you wash it, make sure that it dries completely before you use it again. Also, avoid leaving your mat in the direct sunlight. This could cause it to lose some of its stickiness. Jade mats are usually heavier than mats made by other manufacturers. Lugging around a heavy mat isn’t fun, but you’ll likely wind up appreciating this feature because the weight keeps the mat from scooting around on the floor as you shift between poses. Most people buy Jade mats for their amazing traction. Even if you perspire to the point of dripping sweat onto your mat when you’re practicing yoga, you won’t lose hand or feet traction on a Jade. This mat will help you keep your down dog perfectly aligned by ensuring that your hands and feet stay put, and when you need stability for yoga’s many balancing poses, your Jade mat will provide that too. Jade makes its mats in the United States, and the company does not produce them from any type of synthetic materials. Jade also develops its mats in compliance with the nation’s environmental and labor protection laws. Since Jade mats are manufactured from natural rubber, the company has become adept at collecting it. To get the material, trees are tapped in the same way as they are for syrup. This manufacturing technique is sustainable, so it’s better for the Earth. The company uses natural rubber because it gives yogis a better grip and features more cushion than synthetic rubber. Along with natural rubber, Jade uses manmade elements. The exact component combination used to make Jade mats is proprietary, but the FDA has approved every included element. The pros of the Jade Harmony mat include its traction-enhanced surface, cushion and sustainability. An added pro is its many color choices. You can buy a purple, pink, orange or teal mat. Colors like lime, olive or slate blue are also available. When you buy a teal mat, Jade will donate $5 to ovarian cancer charities. The company will also donate $5 to breast cancer charities if you buy a pink one. Jade mats come with very minor drawbacks. For instance, when you first unroll the mat, you’ll notice that it smells rubbery. It will take several months for this smell to wear off. If the smell bothers you, then air your mat out in an area that’s well ventilated. Also, the mat will deteriorate. It will do so faster if you’ve mastered yoga jump backs during your practice. With a Jade mat providing the support, you’ll come to your mat during every yoga practice with mindful intent. Not only will the mat encourage you to show up to your yoga studio regularly, but Jade also plants a tree for every yoga mat that it sells. By purchasing a mat from Jade, you’ll be making an investment in the Earth.